Recently I watched a couple movies that I really did not expect to enjoy, and they both surprised me. 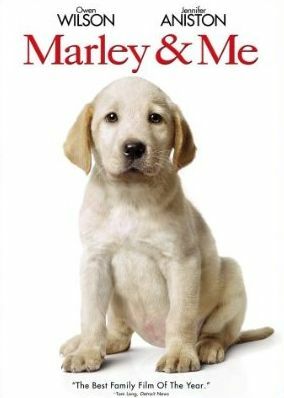 Marley and Me is one of those films. Normally, I don't care too much for dog movies, and I think that still holds true because this wasn't really a dog movie. This was a movie about life and family. Apparently it's based on a book, but I haven't read the book so I can't comment on that. What I can say is that the movie was very well done, the characters and events all felt true-to-life and made it easy to feel a whole range of emotions for these people. The story starts with two newly weds, John and Jenny (played by Owen Wilson and Jennifer Aniston), who move to Southern Florida and get jobs at competing newspapers. Jen starts out getting really cool assignments with articles that stretch across multiple pages, while John gets really lame assignments for articles that take up maybe half a column. Personally, I prefer those, as their straight and to the point, with no treasure hunting involved to find the rest of the story. But then again, I don't buy newspapers. At any rate, he's a bit bummed about his career, and starts to get the feeling that Jen is gonna wanna pop out a poop-factory pretty soon, so his best friend suggests getting a dog to stave that off for a couple years. And thus enters Marley. They get him as a puppy, and pretty much right away find him to be more than a handful. Left alone in the garage for about an hour while John went to pick up Jen at the airport, Marley totally trashes the place. Unable to train this demon dog on they're own, and unable to come up with a the idea to pitch a TV show called "Demolition Dog", they eventually give in and take him to a dog training class... and this woman who claims that any dog can be trained ends up kicking him out for misbehaving! From that point on, John and Jen decide they're on their own... though personally, I would have tried some additional places. Surly someone out there could help them to learn how to get Marley under control. Jumping back to their careers, Jen is still having a great run as a reporter, while John is still assigned to short, crap articles, until one day he is offered a twice weekly column where he can write about whatever he wants. It doesn't take too long before Marley ends up as the subject of his columns, and those adventures start to get kinda popular among the readers, and even gets the newspaper new readers. With both of them now having successful careers, they decide it's time to do the baby thing. Unfortunately, they lose the baby early in the first trimester, something which really hits home with my wife and I. They then decide to take a belated honeymoon to Ireland. We also took a belated honeymoon, but we went to Jamaica! But Ireland is probably nice too. So they leave Marley with a house-sitter/dog-sitter, and as you'd expect, this "dog person" has an impossible time controlling the monster they call Marley, so the happy couple return to what basically amounts to a disaster zone. But at least they learned that they're expecting a baby again, and this time Jen delivers a healthy baby boy. Then a couple years later she has another baby boy, and decides to quit reporting and be a stay at home mom. This prompts John to ask for a raise, and he ends up receiving a promotion, expanding his column from twice weekly to daily. They also decide to move into a bigger house in a safer neighborhood. Yep, that's quite a few extras! This DVD will surely keep you occupied for a while.